Gordon has been living in his own house in Baldoyle, Dublin 13 with the support of his Personal Assistants (PAs) for the past sixteen years. He is an active member of the disability movement and has a broad range of experience. 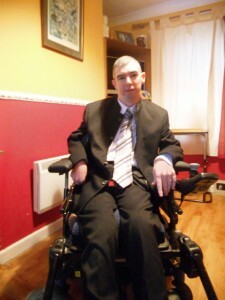 Gordon was a Leader in the Irish Wheelchair Association (IWA) self-directed service for sixteen years. He is also a member of the Leader Consultative Group, a forum for Leaders and IWA senior management. For the past eleven years, Gordon has worked in the Accounts Department of the Citizens Information Board (CIB). Gordon is a fellow member of the Institute of Accounting Technicians of Ireland (IATI). He is a director at Disability Options, a company providing training and support to people with disabilities on Independent Living issues. He is also in charge of payroll for the company. Gordon participates in the Strasbourg Freedom Drive, an event taking place every two years and organised by the European Network on Independent Living (ENIL). Gordon has been involved with Centre for Independent Living (CIL) for the past fifteen years, and he passionately believes in the philosophy of Independent Living. He has been involved in researching the different models of Direct Payments with CIL for the past four to five years, because he believes it is the future. Gordon co-founded Áiseanna Tacaíochta and as part of this he developed his own PA service. He currently has three full Circle of Support members who are highly skilled in finance, training, and advocacy. There are also a number of people who are associate Circle members with a different set of skills, whom he can call upon from time to time if needs be. He has placed an advert on a volunteering website looking for more Circle members, so he is hopeful of increasing the numbers in the next few months.